In a previous post I outlined the importance of backing up your files and how I personally deal with it. Short recap – My main backup system is a Drobo, which is a plug & play RAID system with four harddrives. On the Drobo I have two partitions. One is for Time Machine, which backups all my files from the MacBook Pro. The second partition is for archived files: Files which I do not need to have on the harddrive of the laptop anymore. Since the archive is very big and contains my complete photographic history I am even more cautious with these files. I have a copy of that second Drobo partition on a separate 2 TB external harddrive. This one I keep in a drawer next to my desk. This covers the risk of lightning strike or anything else frying the Drobo. But there is still the risk of fire, theft or a meteor hitting our home. So I have another copy of the archived files. This drive I do not keep at home – it is at a friend’s house and only for updating the archive I collect it from him. So even if a hobby chemist blows up the neighborhood, my archive is still safe at my friend’s home. Until today I had this second archive on two external harddrives, a 500 GB and 300 GB disc (it grew over time, the discs are quite old (a few years, that is old in computer time)). I wanted to substitute the external harddrives with a more universal solution and this is where I purchased an HDD dock. The idea is quite simple: Plug a “naked” harddrive into the dock and connect the dock via USB to your computer. It works pretty much like a card reader. Plug in the harddrive, copy the files, when you are done eject the hard drive and put it somewhere safe. 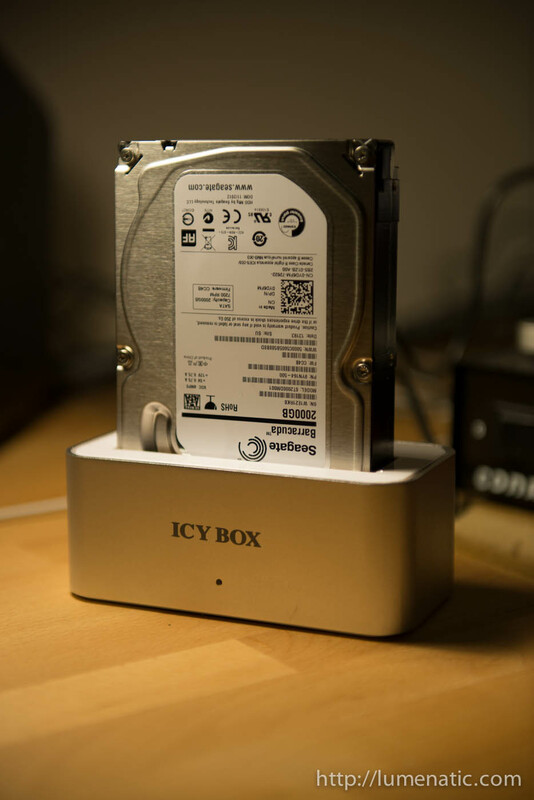 I bought an Icy Box dock with USB 3.0, it cost around 33 Euros. Looks stylish, a white plastic and aluminum design, goes well with my notebook. The dock accepts 3.5″ and 2.4″ HDDs, which are simply plugged into the slot of the dock. No tools required. The harddrive I got with it is a Seagate with 2 TB. On the Macbook I did not need any software, just connect it via USB (unfortunately my notebook is offering only USB 2.0) and off you go. Copying the files took around 7 hours, but since we are talking over 500 GB this is acceptable. The dock frees one from the necessity to install harddrives in a casing and makes handling multiple drives very easy. I read of some users encountering connection problems when copying large volumes of data, but it worked fine with me. I am totally satisfied with the system so far. To sum it up – the newest purchase did not change my backup strategy, but made fulfilling it easier. An HDD dock is cheap and easy to use. It comes handy when you have to manage multiple drives and one should consider making it part of the backup strategy.